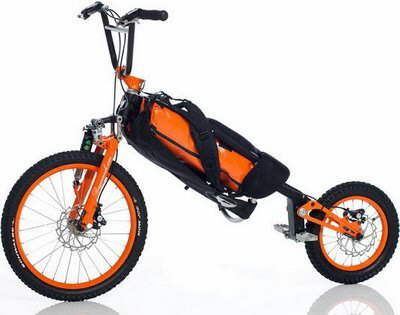 The Folding Bike Bag by Bergmonch is a fun and useful combination of a backpack and downhill bicycle great for hiking uphill and riding down. This 9.5kg Folding Bike Bag features a folding mechanism which keeps it small and handy while it rests comfortably on your back and provides easy access to your equipment. 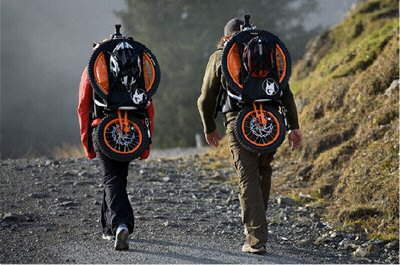 When you hike up to the very top the backpack can be converted into a fully spring-mounted downhill vehicle in only two minutes. Instead of just walking down hill the Bergmonch makes your descent descent into a thrilling experience even on rough trails.